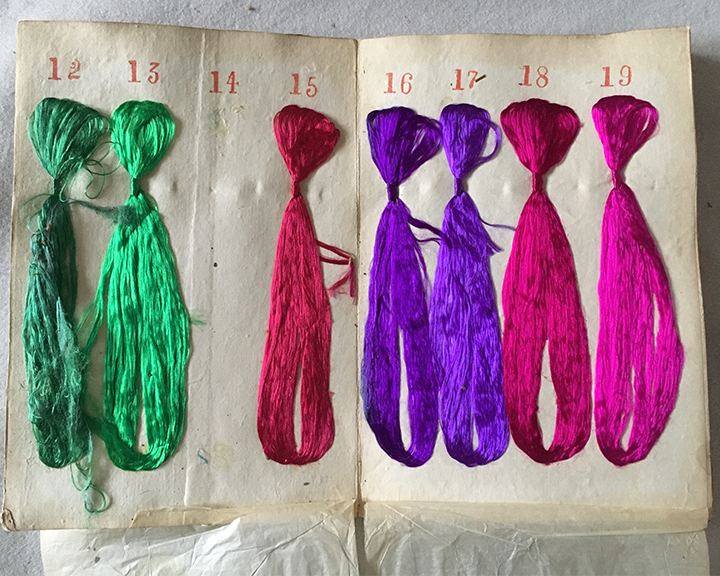 A delightful sample book of 47 shades of Chinese floss silks, many aniline dyed. Inside the front cover it says Poo Shang within a beautiful cusped oval. This must have been a sample book for a travelling salesman. The hand made rose pink card covers opening to reveal a printed ogival the borders filled with flowers, with Poo Shang printed in red ink to the centre, each of the twelve pages with four strands of floss silks , all numbered and seperated by tissue paper. Silk no 14 is missing. The bindings and front and back covers are very well worn. No 44 is a little grubby.